Ladies, what is your everyday mode of transportation going to work or attending errands? I usually take a cab, then MRT to Makati. It's been four months now that I only book UBER X car almost everyday. If you remember I blogged about my first experience taking UBER ride sometime last year. I recommend UBER primarily because booking is fast and easy. At Uber app, you would see if there are available cars within the area. We also compared rates and found that UBER rates are better and cheaper. Of course, there are instances you'll feel bad about the driver. One night, we were in Megamall and the driver cannot find Julia Vargas entrance so he cancelled my booking. We waited so long, I was even charged with P100. I wrote to uber customer help. In less than five minutes I got a response and they refunded my money. With Uber, traveling within Metro Manila has always been easy and convenient. Use my Uber Promocode UberMarjorieUy and get P200 credits which you can use on your first ride. Download the app, register using your Smart number. First time users of the Uber app can get two (2) FREE Uber rides worth P300 each until September 30, 2015 only. I heard the partnership between Uber and Smart. 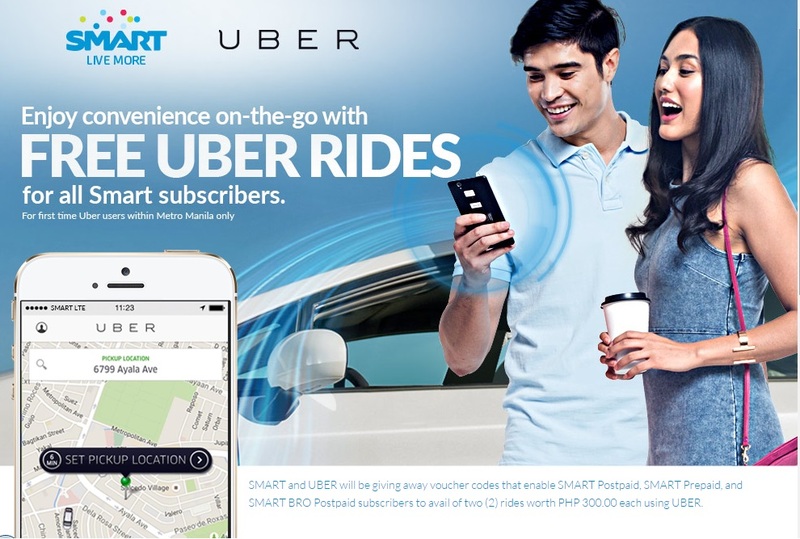 It will be Uber's official mobile partner in the Philippines. With that Uber riders will be able to enjoy free in-car WiFi powered by Smart.